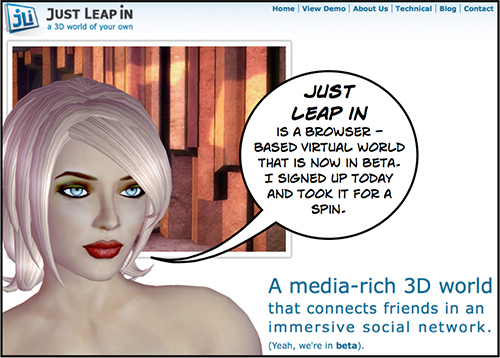 Just Leap In, is a new virtual world beta that runs in your browser. The four page full-sized comic-style review is here. ... in short, everything Google Lively failed at. Hi Soph, Let me know how you like it. K▲LIGUL▲ Thanks! Links are good. Call me egocentric, call me Kanomi, but without a sense of my own self in a virtual space, I don't care how many walls of art there is, it's not a place for me. Agree with soph though, Google Lively was hilarious. I mean just a joke.